Ease into your music making week by checking out five new plug-ins that won't hurt your wallet. Sorry Mac owners, but it's a PC-only list again this week - we do search for OS X software but it remains frustratingly rare. 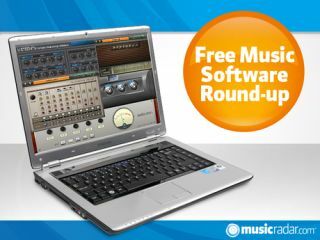 If you've got a new free music software release (particularly a Mac one), make sure you let us know about it by emailing musicradar.pressreleases@futurenet.com with all the details. Each of this synth's two oscillators can draw on a library of around 140 waveforms and operate in Single/Dual/Fat/Ultrafat modes. There's also the 'custom randomisation' feature to tell you about, which can be assigned to any knob and promises to aid the speedy generation of new sounds. You'll have to register on the website to download this one. dTUNE works by adding a pair of detuned voices to the audio signal that you feed it, thus fattening it up. Simply set the amount of detuning, stereo spread and mix level and away you go. The full version costs €9, but if you can live with a nag screen and without the option to save presets, you can have dTUNE for free. One look at the GUI for this one should be enough to let you know which buzzy, portable instrument it emulates. Let's put it this way: if Rolf Harris has a DAW, he'll probably be interested. Stylobox is donationware, so put something in the pot if you're going to use it. The second version of this vintage-style drum machine makes some changes to the way the drum sounds are generated. The kick is virtual analogue rather than sampled; the snare an analogue/sample mix rather than being just sampled; and the clap granular sampled rather than just sampled. Again, Transistor Drums 2.0 is donationware. Yet another compressor, this one makes the not unusual claim to be low on CPU usage but high on sound quality. Choose your ratio, make tweaks using the Attack, Release, Threshold, Softknee and Output Gain controls, and check signal levels in the analogue-style meter.